For the administrative subdivision of Iran, see Kumasi Rural District. "Coomassie" redirects here. For the dye, see Coomassie Brilliant Blue. Kumasi (historically spelled Comassie or Coomassie and usually spelled Kumase in Twi) is a city in Ashanti Region, and is among the largest metropolitan areas in Ghana. Kumasi is near Lake Bosomtwe, in a rain forest region, and is the commercial, industrial and cultural capital of Asanteman. 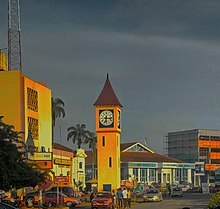 Kumasi is approximately 500 kilometres (300 mi) north of the Equator and 200 kilometres (100 mi) north of the Gulf of Guinea. Kumasi is alternatively known as "The Garden City" because of its many beautiful species of flowers and plants. It is also called Oseikrom (Osei Tutu's town). Kumasi is described as Ghana's second city. The Central Business District of Kumasi includes areas such as Adum, Bantama and Bompata (popularly called Roman Hill) is concentrated with lots of banks, department stalls, and hotels. Economic activities in Kumasi include financial and commercial sectors, pottery, clothing and textile. There is a huge timber processing community in Kumasi serving the needs of people in Ghana. Bantama High Street and Prempeh II Street in Bantama and Adum respectively have the reputation of being the hub of business and night life in Kumasi. There is evidence that the area around Kumasi has been kept cleared since the Neolithic age and that the first human settlement was at Lake Bosomtwe. The name Kumasi comes from the Twi language, meaning "Under the Kum tree." The word "ase" or "asi" means "under, down, or below" and is used in many place names in Ghana, such as Obuasi, Daboase, and Kenyase. Around the end of the 17th century, the Asante Kingdom chief fetish Priest Anokye Komfuo planted three "KUM" trees at different places: one at Kwaaman ruled by the Nananom Ayokofuo, a second one at Apemso-Bankofo ruled by Nananom Aduanafuo, and a third at a village near Fomena and Amoafo called Oboani, which was ruled by Nananom Ɛkoɔnafuo. He wanted to see which of these would become a great city for the kingdom, as he was directed by the oracles. The Kum tree at Kwaaman flourished and became a very big tree under which the King and his people often sat, and so Kwaaman became Kum-ase meaning under Kum. The tree at Oboani was, however, very tiny and for no apparent reason was relatively short. According to oral tradition this small tree however produced a couple of other trees which were all small in size. The name of the village was changed to Kuma meaning small KUM. The Kum tree at Apemso-Bankofo did not grow at all. After some few weeks the leaves got rotten and the tree fell down and so it was said that the Kum tree has died or the Kum tree was dead and so the village became Kum-awu and this later changed to become Kumawu. Kings Way Road in Kumasi, 1925. The city rose to prominence in 1695 when it became capital of the Ashanti Confederacy due to the activities of its ruler Osei Tutu. The ruler of Kumasi, known as the Asantehene, also served as ruler of the Confederacy,with their 1701 victory over Denkyira the Asante confederacy became the primary state among the Ashantis. Parts of the city, including the then royal residence, were destroyed by British troops in the Third Anglo-Ashanti War of 1874. In 1926, following the return of the Ashanti king, Prempeh I after a 30-year exile Kumasi was restored as the ceremonial control over the Ashanti sub-states and the full role of king was restored by the colonial administration in 1935. The city holds an important place in the history of the Ashanti people, as legend claims that it was here Okomfo Anokye received the golden stool, an embodiment of the soul of the Ashanti nation Ashanti. Yaa Asantewaa also a very renowned Ashanti warrior and leader was also taken to Seychelles Island and never returned. Kumasi features a tropical wet and dry climate, with relatively constant temperatures throughout the course of the year. Kumasi averages around 1400 mm (55") of rain per year. The city almost features two rainy seasons: a longer season from March through July and a shorter rainy season from September to November. The months of February through to November is one long wet season, with a relative lull in precipitation in August. Similar to the rest of West Africa, Kumasi experiences the harmattan during the "low sun" months. Lasting from December to February, the harmattan is the primary source of the city's dry season. Features of the city include Fort Kumasi (built by in 1896 to replace an Asante fort and now a museum) and the Kumasi Hat Museum. Royal Asante attractions include the Kumasi National Cultural Centre (including the Prempeh II Jubilee Museum with Asante regalia with a reproduction of the golden stool), the Okomfo Anokye Sword, the Asantehene's Palace (built in 1972), and the Manhyia Palace, dating from 1925, now a museum. Kumasi is home to a zoo. St. Peter's Cathedral Basilica is the seat of the Roman Catholic Archdiocese of Kumasi. There is the large Kumasi Central Market and Tafo Kumasi. Kejetia is also a major tourist destination in Kumasi. It is the biggest open space market in West Africa. As the biggest market in Ghana and West Africa, it enjoys being the envy of all markets in Kumasi. A huge characteristic of Kejetia is its pedestrian traffic, which becomes unbearable during festive occasions like Christmas and Easter. Due to its open market nature, there are a lot of reported fire outbreaks; however, a new market is being developed to tackle the issue of frequent fire outbreaks and to meet modern standards. The main occupations in Kumasi are professional such as services and manufacturing. Kumasi has 50% of the timber industry of Ghana, and the Kaasi Industrial Area plays an important role in the local industry. The Guinness Ghana Breweries is based in Kumasi. Solar panels are prevalent in Kumasi and Ashanti. Solar energy technology is a major energy source and contributor of electricity generation in Ashanti. Much of the shopping and trading activity in the city takes place at Kumasi's shopping streets, in and around Kejetia Market and Adum. These two areas – Kejetia and Adum – have a common boundary. There is also heavy economic activities at Bantama and Asafo. Asafo in particular is the printing hub of Kumasi. Most of the printing done in Kumasi and Ashanti Region as a whole is done in Kumasi. There are both government-assisted primary schools in Kumasi and also private primary schools in Kumasi which educate boys and girls between the ages from 6 to 15. The elite all-boys senior high schools in Kumasi are Prempeh College and Opoku Ware School. And the elite all-girls schools in Kumasi are Yaa Asantewaa Girls Senior High School and St. Louis Senior High School. There are many other good secondary schools in Kumasi. The Kwame Nkrumah University of Science and Technology, Kumasi (formerly the Kumasi College of Technology) is the biggest university in the Ashanti Region and the second biggest in Ghana after the University of Ghana. Former Secretary-General of the United Nations, Kofi Annan attended and graduated from this institution. A number of other public and private universities and tertiary institutions have since been founded in Kumasi, some of which are listed below. Kumasi is served by the Kumasi Airport. As of May 2014 at least four airlines offered regularly scheduled flights to Accra, Takoradi and Sunyani. Airlines servicing the airport included Africa World Airlines, Antrak Air, Royal Fly-GH and Starbow Airlines. The airport has undergone construction to allow for night operations. Public transport in the city is provided by transit buses, a mix of privately owned mini-buses known as tro tros, taxicabs and buses. Tro tros are usually converted mini-buses that run regular, well-known routes. Some taxis also run regular routes, which cost more but provide for a more comfortable ride. In 2002, the city introduced the metro bus services a rapid transit system for public road transport in Kumasi (MetroMass). This was to reduce congestion on roads and to make a larger and more organised bus routine system in the city. In 2017, Uber introduced services in Kumasi, a year after a successful introduction in Accra. Yenko Taxi offers similar service. Kumasi is served by the railway lines to Sekondi-Takoradi and Accra. The train service has been suspended for several years because of damaged track, bridges and locomotives. Currently, no train is running from and to Kumasi due to the collapse of the railway corporation some years back. A$6 billion project to upgrade the railways was due to get underway in 2011. As of 2011[update], construction of the Boankra Inland Port, about 25 kilometres (16 mi) away, has come to a halt. The local football (soccer) team, the Kumasi Asante Kotoko has won several national and continental trophies and awards, and serves as a rival to the Accra based Hearts of Oak. Their Kumasi Sports Stadium, also known as Baba Yara Stadium, was built in 1959, renovated in 1978, and again in 2007 with a seating capacity of 40,000. It is also the home of King Faisal Football Club, a premier division side. There is the Royal Golf Club which has the Asantehene as president. Former Leeds United and Ghana national football team footballer Tony Yeboah was born in Kumasi. Professional wrestler Kofi Kingston was born in Kumasi. Kumasi has the Komfo Anokye Teaching Hospital to support medical training at the university, the West End Hospital, several other private hospitals, public clinics and small hospitals. Recommended private medical facilities include Kumasi Rabito Clinic located at Ahondwo-Daban Kumasi behind the Unity Oil Filling Station. Kumasi has four recreational parks which are opened to the public. The list of recreational parks are Abbey's Park which is located some few meters away from Kejetia, there is also Jackson's Park, Hero's Park located on the same premises as the Baba Yara Sports Stadium and finally the Rattray Park which was commissioned in 2016. * Numbers in date column list the year of twinning. ^ "Demographic Characteristics". Ghanadistricts.com. Archived from the original on 3 May 2011. Retrieved 16 August 2010. ^ "World Gazetteer online". World-gazetteer.com. Archived from the original on 11 January 2012. ^ "COOMASSIE AND MAGDALA: The Story of Two British Campaigns in Africa". Naval & Military Press. Retrieved 28 October 2016. ^ "The grasscutter shows why it is hard to stop bushmeat hunting". The Economist. 31 August 2017. ^ a b Morgan, Henry James, ed. (1903). Types of Canadian Women and of Women who are or have been Connected with Canada. Toronto: Williams Briggs. p. 160. ^ "World Weather Information Service–Kumasi". World Meteorological Organization. Retrieved 14 June 2015. ^ "Ghana–Kumasi". Centro de Investigaciones Fitosociológicas. Retrieved 14 June 2015. ^ "Station 65442: Kumasi". Global station data 1961–1990—Sunshine Duration. Deutscher Wetterdienst. Retrieved 14 June 2015. ^ "President Respects All Tribes – NDC". Ghana Broadcasting Corporation. 9 May 2014. Retrieved 9 May 2014. ^ "Ashanti Region". Metro Mass Transit Ltd. Retrieved 1 December 2011. ^ "Bus Rapid Transit System". Metro Mass Transit Ltd. Retrieved 1 December 2011. ^ "Ghana, China signs railway contract". Ghana News Link. 30 November 2010. Retrieved 1 December 2011. ^ "Baonkra Inland Port Project, stuck?". Kapital News. Kapital Radio 97.1 FM. 7 February 2011. Archived from the original on 18 January 2012. Retrieved 1 December 2011. ^ Kumasi Sports Stadium Ready Archived 28 September 2007 at the Wayback Machine. TheStatesManOnline.com. Wikimedia Commons has media related to Kumasi. Wikivoyage has a travel guide for Kumasi.